With providers engaging more with risk stratification tools, unstructured data and free text from Electronic Health Records (EHRs), a potential exists to more effectively identify frailty markers and improve the prediction of health care utilization outcomes. This document highlights findings from a study by Johns Hopkins Center for Population Health Information Technology (CPHIT) which extracted free text from EHR and combined this with structured EHR and claims data. 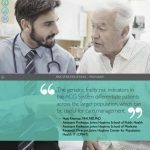 A second study sought to use ACG System markers to estimate the relationship between geriatric risk factors and health care utilization. Can this be used to better identify patients with geriatric risk factors? Learn more.